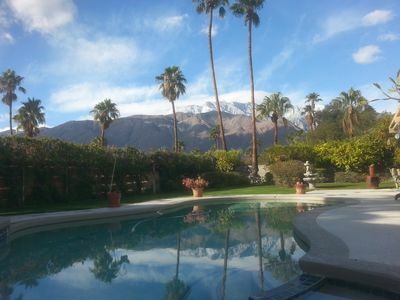 Better than new Palm Springs Vacation Home Rental created for the seasoned world traveler. Go from the Jet Way to Poolside in a matter of minutes. 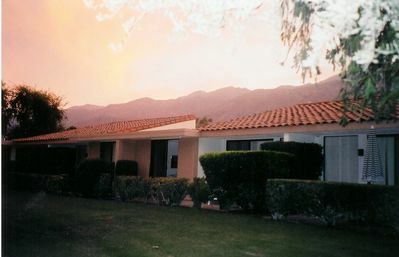 Entire property has been renovated. New kitchen and baths. Fabulous resort-style pool yard that has been completely walled for privacy. Stunning mountain views from the heated inground pool and covered dining pavilion. Awesome fire feature. 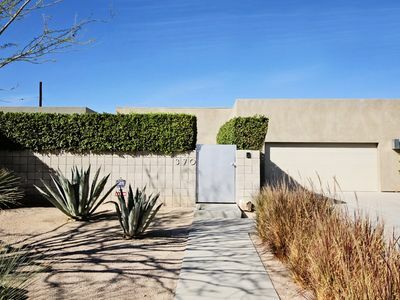 Clean, sleek, bright designer chic home where it’s all about relaxing in the Palm Springs sunshine. 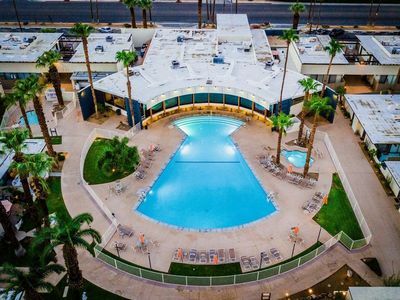 The private yard has an inground heated pool surrounded by lounge chairs, shade umbrellas, an outdoor covered dining pavilion, gas BBQ and a firepit lounge. Walled and gated for privacy. Mature citrus trees, lush grass, mountain views and the home’s original olive trees all add to the magic of this special property. It’s the perfect place for living the good life! 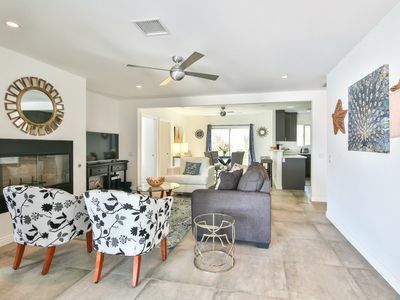 This bright and spacious vacation home has been perfectly planned for comfort and relaxing in the sunshine! 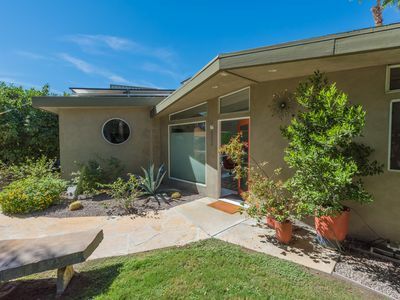 It’s been completely remodeled - yet still honors the home's midcentury architecture - preserving its clean lines, open concept floor plan and walls of glass that blur the lines between indoor outdoor living. 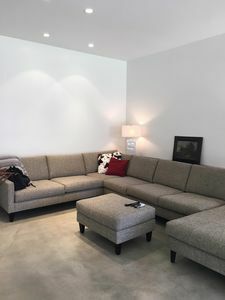 Totally updated for the way we live today - you’ll find a brand new kitchen and bathrooms, high-speed internet, 4 flat screen TVs and comfortable sleeping quarters. The kitchen, living and dining are all open to each other - perfect for spending time with your entire group. The kitchen has stainless appliances, a gas range and gleaming quartz countertops. 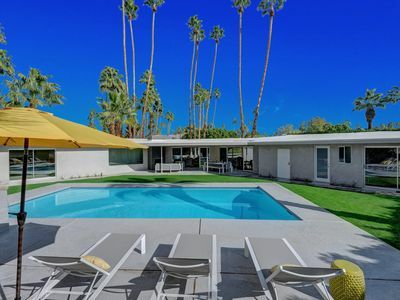 And in true Palm Springs style, the entire back of the house has walls of glass that reveal the pool and patio area. Each of the three bedrooms has a hotel-quality mattress, flatscreen TV and ample storage. The deluxe Master Suite offers a King bed, direct pool access and en suite bath. 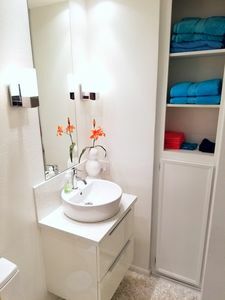 There are two additional Queen Guest Rooms that share easy access to the hall bathroom. 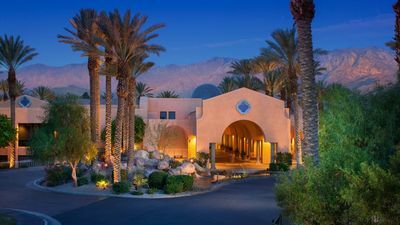 Just a 2 minute drive or 10 minute walk to Albertsons supermarket, restaurants, shops, boutiques, galleries, the casino, convention center, cabarets and all the fun of Palm Canyon Drive! 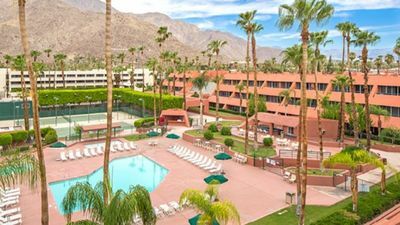 Grocery stores, casual restaurants, coffee places and other neighborhood conveniences are all very close by. 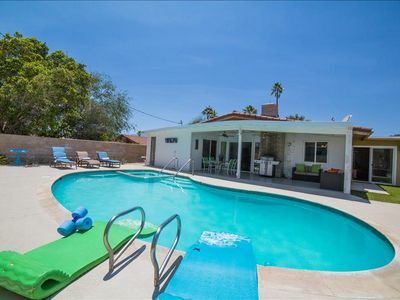 Mid-century Alexander with pool, high end finishes and mountain views. 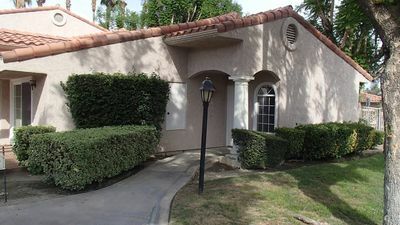 Updated 3 Bedroom Next To Pool! 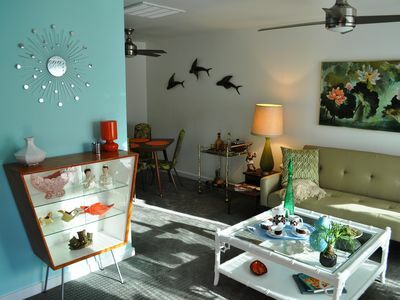 One Block from Downtown with Mid-Century Style and Modern Extras! Deepwell Modern - Very Private Pool Yard!